We want to thank you all for your prayers and support which give us the strength to continue doing whatever we can for the Kingdom of God. We have a wonderful testimony already from our arrival to Argentina at the airport. Once again, we were able to go through customs with an extra print station computer for Brother Lazaro, along with other items without having to pay duty or with any great difficulty; even if we saw how some custom officers were trying to make it hard for us. Upon our arrival to Esquel, I got in contact immediately with Brother Jose and his family so I could arrange the trip to the youth camp in Chile for the young people. That was going to be 26 hours travelling by bus. A few days later we started our trip to Chile, to the Concepcion area, right where the big earthquake was last year. We could still see some devastated places and the people continue in fear because still the earth is trembling. About a week before we arrived, there was another tremor felt. We were able to get our vehicle and drive to Brother Hugo’s church to spend the weekend with them. We could see the hand of the Lord and His victory once more as one of Brother Hugo’s grandsons came out of the world and he is the one who is working on the print station, printing many Messages. At this time, they are in contact with other churches and assessing the needs for future Message printing. 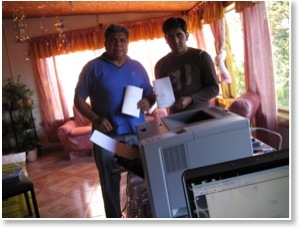 Last Monday, early in the morning, we started our trip back to Argentina with the printer and our personal belongings. When we arrived at the Argentina border, they confiscated the truck and we had to unload the whole truck and leave it at the border because our vehicle custom papers were expired. 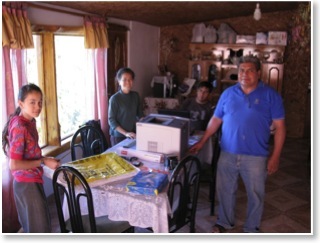 We arrived at Brother Lazaro’s house and the next day we set up the print station. Brother Lazaro and the believers were so excited and blessed. I spoke to Brother Lazaro many hours, listening to how he is going to reach out to so many ministers that he knows and different groups which practically don’t have any literature of Brother Branham. Our next move is to go down to Esquel area with Brother Lazaro and have some services with the believers over there. I already spoke to the mayor’s secretary in the municipality of the town of Trevelin (that is where Brother Jose and other believers are) with the intention of getting some land to build a church and to also have a Bible school, to teach basic English to the children, and build a greenhouse on the premises for the people to learn and to benefit from the production. The municipality gave me good expectations and now they require from us to present them with a formal project. Please pray for all these matters and for the Lord to give us strength and vision in His perfect will.